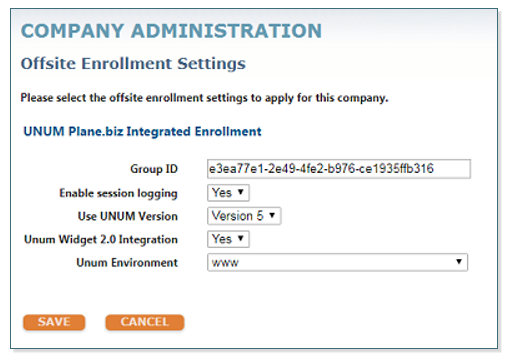 Click the Offsite Enrollment checkbox. To utilize the widget with these benefits you may only select the following benefits from the Benefits tab. Proceed to add the Outline of Benefits and Plan Designs for each plan. Enter the Unum Case Number as the Policy Number. Only Employees that are Active or on FMLA are eligible to enroll for these Unum plans. After you have added your plan designs, click on Company Administration. Click on Offsite Enrollment Settings. The Group ID is the GUID ID. Unum Widge 2.0 Integration should be set to Yes. Unum Environment should be set to www. You are now ready to review the widget in bCEnroll.